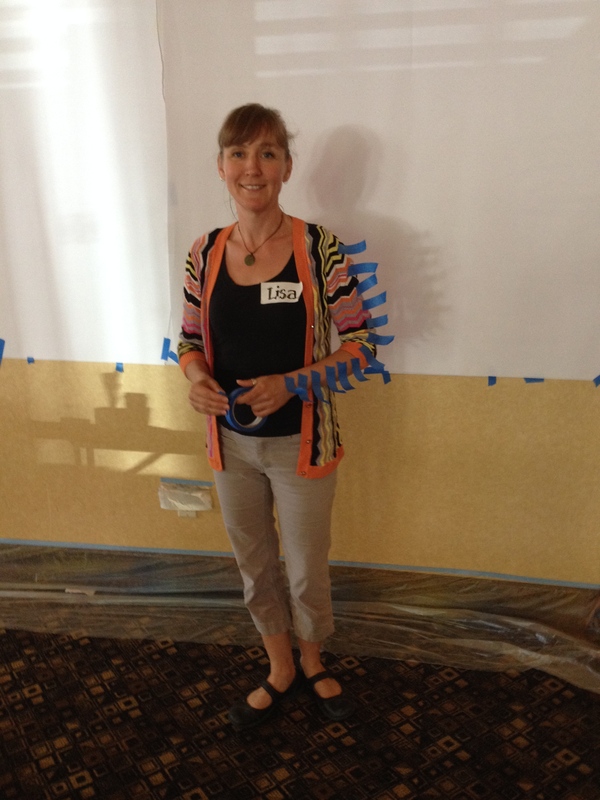 Guest Blogger and Social Reporter Lisa Thiessen demonstrates tape tricks! You might have heard about graphic facilitation, been in a meeting with visuals as part of the process, or simply wondered what all the fuss is about. Why would we change the way we look at facilitated experience? What’s in it for the people in the room? Graphic facilitation is growing in acceptance throughout the corporate and social sectors due to the level of engagement it engenders. What do people do when confronted with large scale paper and drawing? Generally, they respond with genuine interest, curiosity, and a sense of play. Having the invisible made visible is so powerful! It allows people to feel heard, and brings greater depth to the expression, “I see what you mean”. I had the great pleasure of attending the 2015 Rosviz workshop this week, and of watching a group of facilitators grow individually and collectively in their understanding of strategies for incorporating visuals into their work. From visual introductions to visual harvest and everything in between, there were many aha! moments, thoughtful moments, and much intellectual risk taking. See pics on Flickr! Tweets are all tagged #rosviz ! There’s a big difference between being able to draw well and create something of beauty, and to be able to capably communicate with visuals. Visual facilitation often reflects the messiness, the risk taking, the deeply disorganized thinking that is part of synthesis. The drawing in this context doesn’t have to look pretty – it needs to communicate. Visuals take our ideas and make them spatial, make them tangible. Sometimes they look like a story, sometimes a web, and sometimes, a mess. The goal of graphic facilitation is generally not to make a ‘pretty’ artifact (though sometimes that is part of the process), but to allow the disorganized, difficult business of collaboration move through all of its stages to a state of greater clarity. Visuals allow for the distillation of complex ideas, for the more clear communication of concepts. The Rosviz workshop covered so many aspects of facilitation in a visual context uniquely, by fully embedding the facilitation techniques as the workshop itself. Participants had hands-on experience moving through different processes, learning by doing. They had an opportunity, once the foundations of visual communication were in place, to ask for emphasis on the areas that the group saw as their needs. To create their own experience, with guidance, to taste what it was to host themselves somewhat, to facilitate their own experience, to be engaged in their own experience of learning. This was one of the master strokes of the workshop, in my opinion. They talked a lot about ways that groups work, about the Art of Hosting, and about responding to participants in ways that create a more meaningful experience. This group had the opportunity to make that happen through the design of the workshop itself. I originally attended Rosviz in 2011. I had been doing graphic recording already at that time, and wanted to see if there was anything fundamental that I didn’t know. I hadn’t fully understood the distinction between graphic recording and graphic facilitation. At the time, I thought that every process had to have a nice looking artifact at the end, something to ‘show’. I hadn’t seen things like some of David Sibbet’s facilitation visuals, with lines and marks all over them – how the visuals can literally be a map of an experience. I’d never considered that process documents need not make sense to anyone but with whom they are made. Being in that group, then, was completely eye opening for me! Even 4 years later, I continue to process things learned or seen at that workshop. Last year I joined in briefly at the end of one of the days, pitching in to cut paper, meeting up for the alumni dinner. I’d been doing more illustration and graphic recording, working with facilitators to help make interesting, engaging experiences and artifacts. Being in the Rosviz 2014 room was again exciting both because this group was seeing the power of visual facilitation in action, AND because they were having a different experience than I had had 2 years before! True to the style of the workshop, with fundamentals in place, other pieces shifted and changed based on the needs and wants of the group. This year I had the opportunity to attend as Social Reporter. It was a new angle to look at Rosviz from, lifted out of the experience somewhat, seeing it from the artificial distance created by the viewfinder of a camera. This group? They had their own unique experience. There was, again, a tremendous amount of wisdom in the room. Everyone is a part of this messy business of creating change in their professions and were looking for ways to incorporate visuals. They got to try learn the fundamentals, they got to create their own experiences of harvest. Some of those chunks of harvest have the potential to be ongoing, to enrich the experiences of others. There were beautiful artifacts, there were messy ones. Again, I learned so much. My harvest? The experience of visual facilitation is as rich as the diversity of the people in the room. Visuals allow for clarity of communication across differences of language and culture. The use of visuals and styles of facilitation are growing and changing all the time. The core of it all is engagement, sense making, clarity. Harvest can look like whatever we want it to. Harvest doesn’t have to end at the end of the facilitated experience. The best experiences inform our next actions, our next paths, creating real change. My harvest is ongoing, growing and changing with my practice.